Pins and needles cold, whiff's of catching breath, ever gasping heights and so much alive in one moment, suffice to say that the Everest Base Camp trek in Nepal would let you die a happy and content! Mount Everest attributes to the world's most enthralling, stupendous and tall mountain that has ever lived. Taking birth in the lap of Nepal, it lies in the range that we know as the ‘Mahalangur’, stretching amidst Nepal and Tibet. It is believed that the elevation of the peak is of daunting 8,848 mts. Stepping aside from its statistical and geographical front, what really captures the heart and eye are the dialects of beauty and wonder it has. People from all the walks and nooks of the world, aspire to have a rendezvous with this ever shining and brandishing peak whose base camp is in Nepal. The mountain doesn't just serve as vision, but it also makes a person reverberate with the spirit of doing and succeeding. The process can be an exhilarating, rewarding and a life changing experience. Although climbing a mountain can be one of life’s greatest accomplishments, it is more than panoramic views, the satisfaction of reaching the summit, or a true wilderness experience. All these things sealed in an envelope is what we can perhaps say is the Everest Base Camp all about. It could test you in a million ways and ensure an experience of a lifetime. A distant view of a mountain may speak of adventure, but the mountains only hint at the joys and hardship that await the climber. 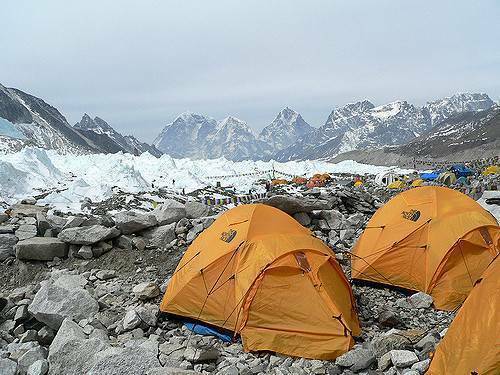 Reaching the Everest Base Camp cannot be regarded as a light hearted task. It is indeed for a courteous and determined one but isn't that how one's life supposed to be? To live and to truly see. To see and to really live. With this expedition rapidly emerging popular and plentitude of people seen every year, all pumped up to take the journey of their life, don't you still rock in that old chair of yours front and forth, but go touch the skies because that's the limit.